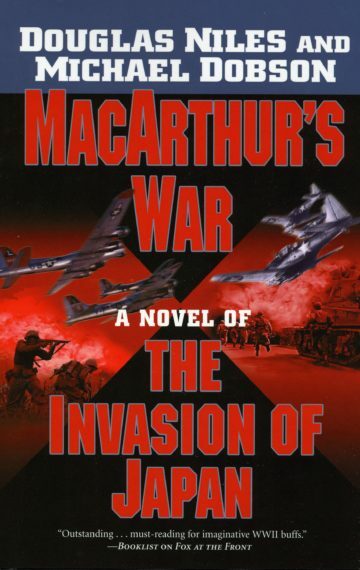 Just as Fox on the Rhine and Fox at the Front showed readers an alternate Europe in which Hitler had been killed, thereby radically changing the course of World War II, Douglas Niles and Michael Dobson bring us the Battle of Midway with a very different outcome. At Midway, the Allies are wildly out maneuvered and sent home in disgrace. Back in the States, the ultra-secret Manhattan Project is derailed by a terrible accident. President Roosevelt’s approval ratings drop dramatically. Congress is desperate and the country cries out for a hero. And General Douglas MacArthur is there to seize the moment. He believes way to Japan lies through the Philippines, but for that he needs the US Navy … and the Navy has its own plans. Unless Douglas MacArthur gets there first. MacArthur’s War shows a very different approach to World War II in the Pacific. With battles ranging from Guadalcanal to the White House, MacArthur tries to outmaneuver and overcome the wide range of forces arrayed against him — leading at last to Operation Downfall, the planned invasion of Japan without nuclear weapons. Downfall’s first phase, Operation Olympic, becomes the latest amphibious operation in history, with 42 aircraft carriers, 24 battleships, and 400 destroyers carrying 13 divisions in a simultaneous attack on 36 separate beaches. But the final act, Operation Coronet, is even larger and more dangerous, a strike at Japan’s capital city, Tokyo. Go inside the secret world of some of the most famous people of the age: MacArthur. FDR. Yamamoto. The Emperor of Japan and his closest advisor. Nimitz. Patton. King. And many more. Follow three boys from Baltimore, two brothers and their best friend, whose individual war stories span the conflict. One, a pilot, is a pioneer of the dangerous tactic known as skip-bombing. Another, a Marine, becomes a leader when all those around him fall in the invasion. And a third, accidentally transferred to the Philippines, finds himself trapped on Corregidor, and later experiences the horror of POW captivity. This titanic book shows the war that might have been — the greatest battle, and the greatest tragedy, in history.